The Aquacut Quattro is a unique new patented generation of cutting tool, taking the original concept of air abrasion and with the addition of fluid, creating Aquabrasion, a far more efficient and gentle technology. Besides functioning as a cutting tool, the Aquacut also cleans, polishes and dries. The AQUACUT's unique fluid curtain suppresses the powder emissions common with air abrasion units from the past, while simultaneously increasing cutting efficiency by constantly removing debris created during the cutting process. The use of fluid reduces the need for high air pressure levels, thereby increasing patient comfort. How is it used? When your patient sits down in the dental chair, you are able to perform a fast and effective cleaning of the oral area. This will present you with a clearer indication of the patient's dental condition. 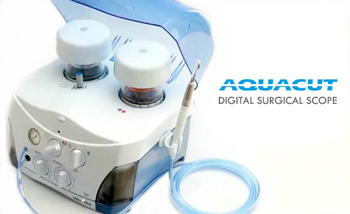 At the turn of a switch, the AQUACUT changes into a powerful cutting tool that will in many instances cancel the need to use the dental turbine. It is a non-contact instrument, there is no vibration, heat generation or turbine noise. In most cases there is no need for an anesthetic.